HF: The 1962 Hong Kong Annual Report states: The Standard Oil Company of New York, now known as the Mobil Petroleum Company Incorporated, started operations in Hong Kong in 1894 and built their present oil berth and tank farm at Lai Chi Kok in 1904. THE STANDARD OIL COMPANY OF NEW YORK. The extent of the highly remunerative business carried on by the Standard Oil Company, of which Mr. J. D. Rockefeller, the great American millionaire is the head, forms the subject of comment in many parts of the world. A branch of the undertaking was opened in Hongkong in August, 1894, by Mr. George Henry Wheeler, who had formerly been a partner in the firm of Russel & Co., at Shanghai. Since 1898, in spite of considerable competition from the Asiatic Petroleum Company, and the Maatschappij tot Mijnbosch-en Landbouwexploitatie in Langkat, their trade has increased several hundred per cent. 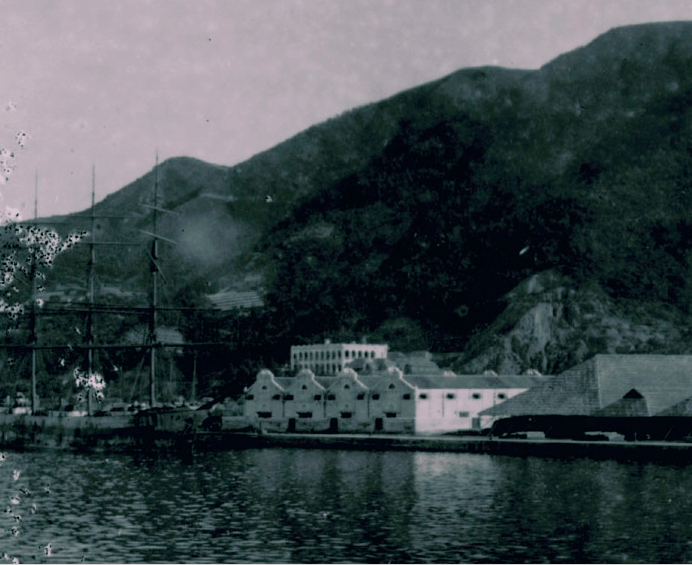 This photograph of the British ship Queen Margaret unloading oil at the Standard Oil Company’s godown in Hong Kong is not connected to the main article. Since 1903 the Company have extended their operations very considerably, and are now erecting large plants at Foochow, Amoy, Swatow, Canton, Haippong, Saigon, Tourane. Bangkok, Manila, and Hongkong (Lai Chi Kok) which control numerous small stations. The Hongkong branch is now known as the South China Department, and covers the district of China as far east and north as Foochow, and includes Formosa and the Philippines, Indo-China, and Siam. In February, 1895, the present general manager, Mr. J. W. Bolles, joined the Hongkong branch as chief assistant to Mr. Wheeler, having previously been manager of one of the Company’s interests in Virginia, U.S.A. In June of the same year, Mr. W. B. Walker, the present assistant manager came to the office as an assistant, and from time to time the staff has been augmented by Messrs. D. H. Cameron, now manager at Canton; L. I. Thomas, now manager of the coast port, at Amoy; W. W. Clark, now manager of Indo-China; W. D. Kraft, second assistant manager; F. H. McHugh, chief accountant, and several others from the American offices.